Based in the Manchester Millyard, PillPack is reinventing the pharmacy and how patients interact with it. 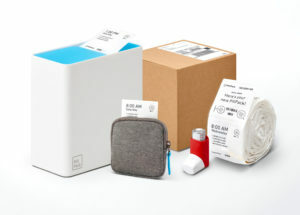 By streamlining the entire process into a box of packets of pre-sorted medications, shipped directly to a patient’s doorstep each month, PillPack is eliminating confusion and hassle for their customers by radically simplifying the process for individuals on numerous medications. TJ Parker, the CEO and co-founder of PillPack, grew up working in his family’s New Hampshire pharmacy. Not only did this upbringing prime him to pursue pharmacy as a career, but gave him a unique view into a number of the problems within the industry. Parker recalls “watching people struggle with managing their medications,” juggling “dozens of pill bottles, weekly trips to the pharmacy, and time-consuming do-it-yourself organization.” He found that this system, as a whole, was “complicated, confusing, and did little to support health or wellness” of individual patients, which is—by definition—the focus of the pharmaceutical industry. Furthermore, Parker notes that many “pharmacists, while well-intentioned, had limited resources to help” alleviate these problems. As a teenager, Parker delivered medications to patients of his family’s pharmacy. He vividly recalls one particular elderly women whose eyesight was so poor that she couldn’t read the labels of her ten identical pill bottles. In order to help this woman, Parker drew the first letter of each medication on the label in Sharpie. He was struck by the absurdity that, in a society with “satellites in orbit [and] cars driving themselves,” the best way to help this woman was manually bolding letters on each of her prescription bottles. PillPack benefited from a number of resources, not least among which was Parker’s background in the pharmacy industry and his understanding of the system. His co-founder, Elliot Cohen, “has a deep computer science background and knew how to actually build the systems that can fix complicated problems.” The combination of Parker and Cohen’s skills allowed this vision of a significantly less cumbersome, redesigned pharmacy to become a reality. When PillPack was just starting out, Parker remembers being advised to “focus relentlessly on who your customer is and how you can solve real problems for that person.” This line of thinking is certainly an apparent element of PillPack’s approach to business and has allowed them to stay focused. Moreover, Parker believes that a deep understanding of the entirety of your industry is a prerequisite to success in any form of entrepreneurship. He explains that “it’s much easier to solve complicated problems when you deeply understand them” PillPack’s success thus far in this undertaking is a testament to the power of channeling a deep knowledge and understanding of an industry through a singular, customer-centric focus. This software, Parker says, “allows us to think a lot more broadly about the kinds of services and partnerships we could create to better serve our core customer.” This stage in PillPack’s development represents a continued focus on innovation with the singular goal of simplifying the customer experience, a mentality that has and will continue to drive their success.